We are happy to present to you the world’s very first certified Charles & Colvard Forever One Moissanite gems. Michael Nguyen, Founder of Fire & Brilliance, is proud to introduce the world’s very first certified Charles & Colvard (C&C) Forever One moissanite gems! In our professional opinion, the true beauty of a gem is captured by its fire and brilliance created through light refraction and reflections. “Light Behavior Grade” is the certificate’s highlighting factor as it measures the “Brilliance, Sparkle, and Intensity” while providing a “Brilliancy Image” for a visual reference. 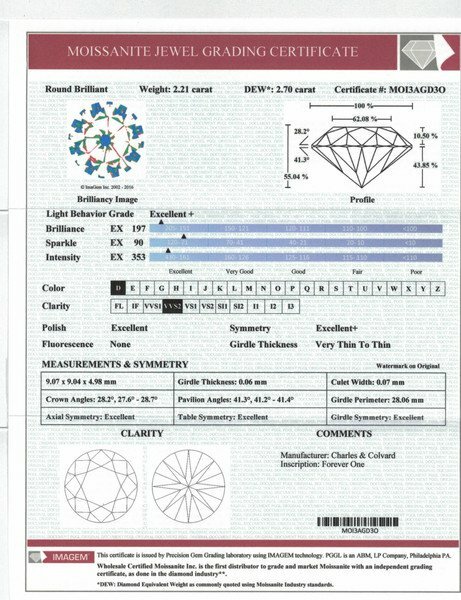 Fire & Brilliance hand-picks only the best moissanite gems for these grading reports. The initial step in grading these gems requires meeting specific quality standards prior to being considered as “Acceptable.” The next qualifying step is to only select the top-tiered gems after they are graded by PGGL leaving only the best stones available for sale. This process can be tedious and time-consuming; and therefore, supply is limited.